I once knew a chap who absolutely hated mince pies. To be honest they are not my favourite Christmas fare, but they are quite nice in the right context (hot, topped with some thick brandy cream and served with a glass of mulled wine of the side, ideally). Anyway, this fellow loathed them. The reason for this was the first time he was offered one, as a child of about 11 I believe, he had never heard of the things before. Nevertheless, he accepted, assuming it was just a small version of a hot minced beef pie. However, when he bit into what he expected to be a meaty treat, he found instead some very unexpected sugary fruit. The experience of getting such intense sweetness when he expected savoury put him off the things for life. It is fairly common knowledge, I think, that mince pies at one point back in the mists of time actually did contain real meat (and no, I don’t just mean beef suet). It’s the kind of fact that comes up in Christmas quizzes and the like around this time of year. The name “mincemeat” is apparently a remnant from the days when there would be some meat in there. The taste would probably not have been much less surprising to a modern day eater expecting a standard meat pie though, for as we shall see in the recipe (coming soon in the next post!) there was indeed plenty we would recognise in early modern minced pies. In looking for recipes, I found quite a number. Not all contained beef mince, however – I found a recipe for “Minced Pye of Eggs” in one of the ever helpful Hannah Woolley’s cookbooks (The compleat servant-maid, 1677) containing hard boiled eggs along with suet, dried fruit, sugar, caraway seeds,orange peel and a few other sweet things. Mounsieur Marnette’s The perfect cook (1656) features recipes for Italian style minced pies (featuring veal, partidge, chesnuts, currants, sugar, sweet-breads and many more ingredients), Spanish minced pies (including capon, pork, mutton, kidney, bacon, suet, leeks, salt and sweet spices), several kinds of fish-based minced pies, and “Princesse” pies (containing roast or boiled meat, beef marrow and sweetbreads). The most popular ingredient, however, did seem to be beef, or more specifically neat’s tongue (ox tongue). The aforementioned Hannah Woolley cookbook has tongue as the primary ingredient for “An excellent Minc’d pie”, as does The accomplished ladies rich closet of rarities (J.S., 1687). I didn’t go for the tongue when I tried it as I already had some beef leftover from cooking the hash of raw beef. 1 A coller of Brawn. 2 Stewed Broth of Mutton Marrow bones. 4 A pottage of Caponets. 5 A Breast of Veal in Stoffado. 7 A Chine of Beef, or Surloin roste. 9 A Jegote of Mutton with Anchove sauce. 10 A made dish of Sweetbread. 12 A Pasty of Venison. 13 A Kid with a Pudding in his Belly. 15 A hanch of Venison rosted. 16 A Turkey roste and stuck with Cloves. 17 A made dish of Chickens in Puff-paste. 18 Two Brangeese rosted, one larded. 19 Two large Capons one larded. The second course for the same Mess. Oranges and Lemons. 1 A young Lamb or Kid. 2 Two couple of Rabits, two larded. 3 A Pig soust with Tongues. 4 Three Ducks, one larded. 5 Three Pheasants, 1 larded. 7 Three brace of Partridge, three larded. 8 Made dish in puff-paste. 9 Bolonia Sausage, and Anchove, Mushrooms, and Caviare, and pickled Oysters in a dish. 10 Six Teels, three larded. 11 A Gammon of Westfalia Bacon. 12 Ten Plovers, five larded. 13 A Quince Pie, or Warden Pie. 14 Six Woodcocks, 3 larded. 15 A standing Tart in puffpaste, preserved fruits, Pippins, &c.
16 A dish of Larks. 17 Six dried Neats Tongues. Mince P. You are a stinking peice of Beef to abuse me so, I make you rotten? All. With all our hearts? Eloquent Strong-Beer! Strong B. Then first for you Mr Plumb Pottage: Since it hath been so long a Custome for you to be first ushered to the Table, we shall continue it still to you during the time of Christmas, so that you do not take it ill, that some at other times make use of you last of all, as is sometime necessary to fill up the chinks, And for you Mr Mince-pye, for the time of Christmas also are to be the Senior in all mens mouths, but ever after to disappear and vanish. As the Prince at Lincolns Inn was cominus factoreum for twelve days but afterwards shrunk into his former peasantry for ever after So must you yeild the preheminence to Mr Roast Beef as royal for all the year after. What say ye, are ye all satisfied! All. O very well, very well! Rhetorical Strong Beer! Strong B. Come on then, then lets end all differences in a cup of Strong Bub, and spend the time in singing and carouzing a health to all that love Plumb-Pottage, Mince pye, Roast Beef and Strong Beer. ‘Tis as plentiful all the whole year! I hope you enjoyed that. Don’t say I never give you anything! Merry Christmas everyone! 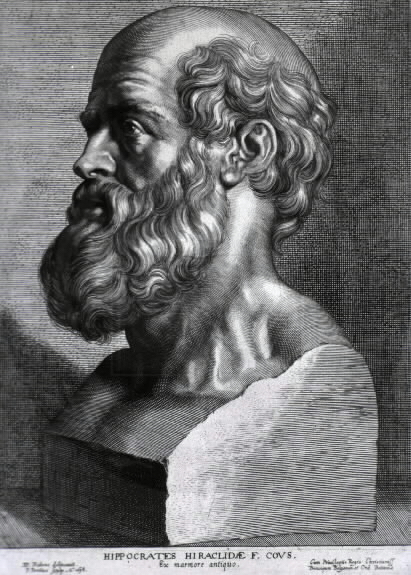 Hippocrates, engraving by Peter Paul Rubens, 1638. Image via Wikipedia. In this blog, I’m looking drink rather than food, and like the drinks I’ve looked at before, this one is alcoholic. Early modern people drank rather a lot of alcohol, and it wasn’t just reserved for an evening tipple – beer, and especially ale, were regularly drunk throughout the day with meals, even breakfast. Water was generally too unsanitary to drink, and tea and coffee entered the national diet sometime around the mid-to-late 17th century, so for the majority of the early modern period were not widely consumed. By the 18th century tea and coffee were very popular indeed, but heavy drinking had certainly not gone away – just look at the gin crisis. Anyway, early modern society had what you might call a complex relationship with alcohol, though I suppose the same could be said about many societies, including our own. Drunkenness was a problem much bemoaned by many 16th and 17th century writers, such as James Hart of Northampton who, in his treatise on health and morality Klinike, or the Diet of the Diseased (1633), wrote that “Drunkenness is an excessive and unseasonable powring downe of strong drinke” that was the cause of “mischiefs there insuing to the soule, body, and good”. On the other hand, alcoholic drinks were a key part of the everyday diet, they provided nourishment, and in some cases, they were used as medicine. This is where hippocras comes in. Also spelled hypocras, ypocras, ipocras (and others I’m sure), this was an ancient drink, popular during medieval times as well, very popular at banquets and for medicinal purposes. Hippocras takes its name from the ancient physician Hippocrates, he of the Hippocratic oath fame, though only indirectly, it is in fact named after the hippocras sleeve. This was an invention of Hippocrates, essentially a bag used to purify water. Presumably this lends its name to hippocras as the drink is made by filtering spiced wine through one of these bags. The medicinal associations of the name, however, were quite fitting given the various uses of the drink. In one 1612 text, Child-birth by Jacques Guillemeau, hippocras is suggested to help “the weake and dainty women” during labour, or alternatively they can “be fed with yelkes of egges, cullis, a tost with wine and sugar”. …Fresh sturgeon, bream, pearch in jelly, a jole of salmon, sturgeon, welks, apples, and pears rosted with sugar can|dy, figs of molisk, raisins, dates capt with minced ginger, wafers, and ipocras. Medicinal or not, hippocras was a popular drink – but did it taste good? I shall soon be finding out when I try making some! It does involve leaving the wine and spices to infuse for a while though, so I won’t be posting the results right away. I have a feeling this is going to be a good one though, my previous adventures in early modern drinks have been some of the nicest things I’ve cooked. Anyway, thanks for reading, come back for the recipe in a week or so! It’s been a while since I’ve been able to post (for a variety of reasons – largely work related), but I’ve been thinking about doing a post on comfits for a while, and I have a little bit of time free so I thought I’d get on with it. I actually tried making comfits when I made the custards, but it was an utter disaster – more on that when I post the results of my second attempt at making them. I found this page with some interesting information about comfit making and some lovely pictures. I just love that one with the mouse, although that might have something to do with my enduring affection for rodents in general (I have two pet rats). A comfit is essentially a sugar coated spice, seed or other small morsel. We still have them today, in fact licorice comfits are one of my favourite sweets. References to comfits in 16th and 17th century drama and poetry seem to be quite frequent. They are sometimes mentioned in diet books and regimens as a way of consuming certain herbs and spices – Thomas Cogan, for example, in The Haven of Health (1584) suggests taking coriander comfits after meals to help those “much troubled by rhumes” – rhume seems to be essentially a runny nose. Comfits were associated quite strongly with banqueting. I have mentioned banquets before, but I don’t think I’ve gone into much detail. It’s worth pointing out that in the medieval and early modern periods, banquet didn’t quite mean what it means today. We think of a banquet as a being a large feast, but in the past the banquet did not generally refer to an entire meal (though it was sometimes used in that sense), but more often to a course served at the end of a meal, after the dessert. It was also sometimes known as a voydee. Comfits, marchpane, candied fruit and other sweetmeats generally made up the banquet course. And that’s basically the gist – the man has a selection of comfits at a banquet, he dances with some ladies, then he goes home, eats the comfits, and thinks about the women. “Long comfites” remind him of a fair, tall and gallant dame, but “in the comfit was a bitter pill, so in the dame might be some bitter will”. Now, this “pill” is not a pill as in a tablet, but it’s an “Orenge pill”, as in peel. Next up, the man eats round coriander seeds which he declares wholesome, and which bring to his mind “a round, plumpe wench”. Ginger is the next kind of comfit, “whose tast did set my mouth all in a heate”, which reminds him of a tall woman “Whose lookes, mought set his mouth and hart on flame”. The man moves onto biscuits next, which make him think about “a prety wenche”. Then he hears someone shouting “fire”, so he runs off to help, and when he gets back someone has eaten up all his comfits. And that’s where it ends. Very curious indeed! I think the link between women and food might warrant some more investigation at some point. Eate Comfites in mine armes, and I will sing. The lines are spoken by Venus, who is trying to tempt Dido’s son Ascanius away so her own son Cupid can temporarily take his place. She also offers him “Sugar-almonds” and sweet conserves. It’s interesting to see just how far back the familiar trope of children having a taste for sweets and sugary things goes. Comfit-makers are often mentioned in plays too, it seems to have been a well known profession. A character in Nicholas Breton’s (him again!) play An olde mans lesson, and a young mans loue (1605), during a little speech on the virtues of feasting, mentions how feasts provide work for “the Vintner, the Grocer. the Comfit-maker, the Cooke, the Brewer and the Butcher”. Even their wives make their way into drama – Hotspur in Henry IV part 1 berates his wife for swearing too meakly “like a comfit-makers wife”. Thanks for reading, good to be back after a little break. The recipe will be along in the next few days. But I must follow the fashion, or die a beggar. Calandrino is the play’s comic relief character – the comedy usually centres around him wanting to fit in at court in spite of his country roots, as seen in the extract above. The difference between country and court life, one plain the other elaborate, is a recurring theme in the play, and is in fact fairly common throughout Renaissance drama, particularly 17th century works. “A custard” does not just refer to the thick yellow stuff we know and love (well, I do anyway), an early modern custard is almost always referring to thick custard baked in a pastry case, we still have these today in the form of custard tarts (which I also love). Enter the Clowne with his Table-bookes. Clowne: Let me see, the Prince is to bee married to morrow, and my young Mistris meanes to keepe a Feast in the Forrest, in honour of his wedding at the Court: Now am I sent as Ca|terer into the City to prouide them victualls, which they charg’d me to buy; no ordinary fare, no more it shall, and therefore I haue cast it thus; First and foremost, wee will haue—(yes downe it shall) we will haue a Gammon of Bacon roasted, and stufft with Oysters; And sixe Black-Puddings to bee serued vp in Sorrell-sops; A pickell’d shoulder of Mutton, and a surloyne of Beefe in White-broth, so much for the first course. Now, for the second, we will haue a Cherry-Tart cut into Rashers and broyled; A Custard Carbonado’d on the coales; A liue Eele swimming in clowted Creame; And sixe Sheepes-heads baked, with the hornes peering out of the pasty-crust. A tablebook is a notebook so I suppose the clown is keeping a note of his bizzare food ideas unless he forgets them. Though I would think it would be hard to forget about the live eel swimming in cream. The first course sounds fairly normal, if extravagant, but everything in the clown’s second course is comically absurd. “A Custard Carbonado’d” is, to quote the OED, “A piece of meat or fish scored across and grilled over coals” which sounds like a very strange thing to do with a custard tart. Enter playing before, Lawrence, Doughty, Arthur, Bantam, Wh tstone, and Gregory, with dishes: A Spirit (over the doore) does some action to the dishes as they enter. The service enters, O well sayd, play up the meat to the Table till all be serv’d in, e see it passe in answer to my bill. The spirit over the door casts a spell on the food that transforms it strange things, and the custards become “cow sheards” – cow dung. Strange goings on with food are often a feature of witchcraft plays – I’ve written a little on this before, see my post on marchpane. Custards are also mentioned in at least two of Heywood’s other plays – How a Man May Choose a Good Wife from a Bad (1602) and The Fair Maid of the Exchange (1607). To skirmish with a field-mouse; they poynt a duell? Or some such daring enemy. as quick as any Gun. in danger of your Lives. I laugh in the face of danger, however, so I shall be ignoring this warning and making a delicious custard from a recipe in Gervase Markham’s Countrey Contentments. Check back for the recipe later in the week! My first food experiment is marchpane, these days more commonly known as marzipan. I’m hoping to get hold of more books and resources as I go along, but for now I only have a few things at my disposal – a couple of original texts from EEBO and a lovely little book about “Banquetting Stuffe” editing by C. Anne Wilson. I thought starting with marchpane would be a good introduction as it is quite a common food mentioned in a lot of Early Modern literature, it’s something we are familiar with today, and also it seems (fingers crossed) like it might not be too difficult to make, nor the ingredients too difficult to get hold of. 1. n Originally: a flat disc of marzipan mounted on wafers and usually decorated with motifs made from similar paste or other materials (by the 18th cent. often iced with sugar and mounted on a rich fruit cake, esp. a bridecake). Subsequently: a cake or sweet made of marzipan; Now hist. Like comfits round in marchpane set. I suppose the “you’re so beautiful you look like a work of art” is fairly ubiquitous, but doesn’t “you’re so beautiful you look like food made to look like a work of art” just give it an extra level? Finally, here’s one more literary mention of marchpane, and weirdly this was the one that made me think about making it in the first place. In Middleton’s The Witch, foods, particularly sweet ones, have a slightly more sinister role. The Witch is, I think, an under-read play, to me it is particularly interesting because it is just so hung up on the idea that eating and luxury are very dangerous things. There are plenty of examples, such as the part where Francisca, an unmarried woman, blames her unwanted pregnancy on the fact that her secret lover wooed her with foods such as “wine, chewets and currant-custards”, leading to my favourite line “I may curse those egg-pies”. As for marchpane, and this is where it gets a little bit icky, Hecate (the titular witch) trades a love potion (also a kind of dangerous food, I suppose) for “a toad in marchpane”, something wicked and witch-like innocuously hidden in something tasty and appealing. See, sweets don’t just make your teeth rot, they are actually a path to the dark side. If you are brave enough to continue after that, then carry on to part 2 for the (toad-free) recipe. Gastronomy Archaeology is a food history blog charting my adventures in Renaissance and Early Modern cookery. These are my culinary experiments with old cookbooks and recipes. I also take a look at the historical background of some of the foods I cook. I’m a food nerd, PhD student at Sussex University, Renaissance literature enthusiast, and intrepid explorer of Early Modern culture through cookery.